Messier 74, sometimes called Phantom Galaxy, is a galaxy located in constellation Pisces. This galaxy has two prominent spiral arms and it is typical example of a spiral galaxy. The distance 35 million light-years from Earth has been estimated, therefore what we are looking at here is 35 million year old picture. 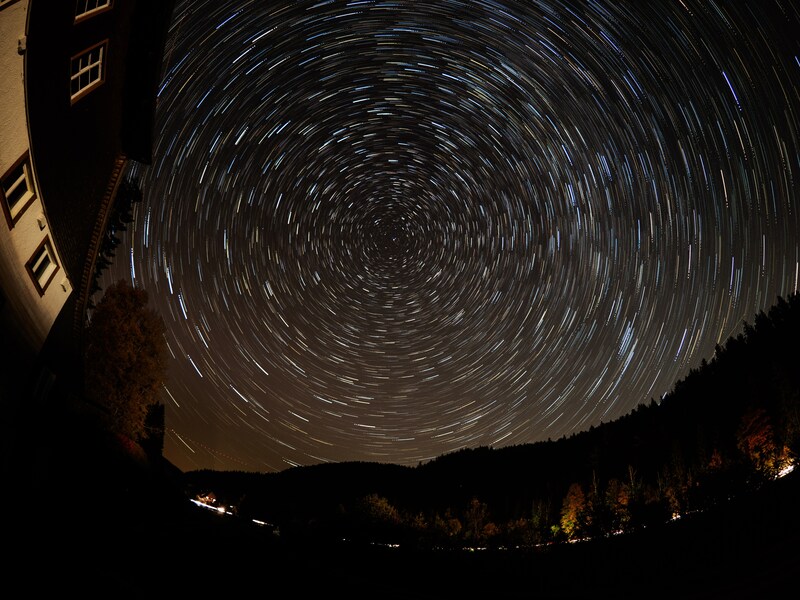 The photo was taken in Schwarzwald under decent dark skies and it’s an integration of 45 photos, each 3 minutes exposure, i.e. 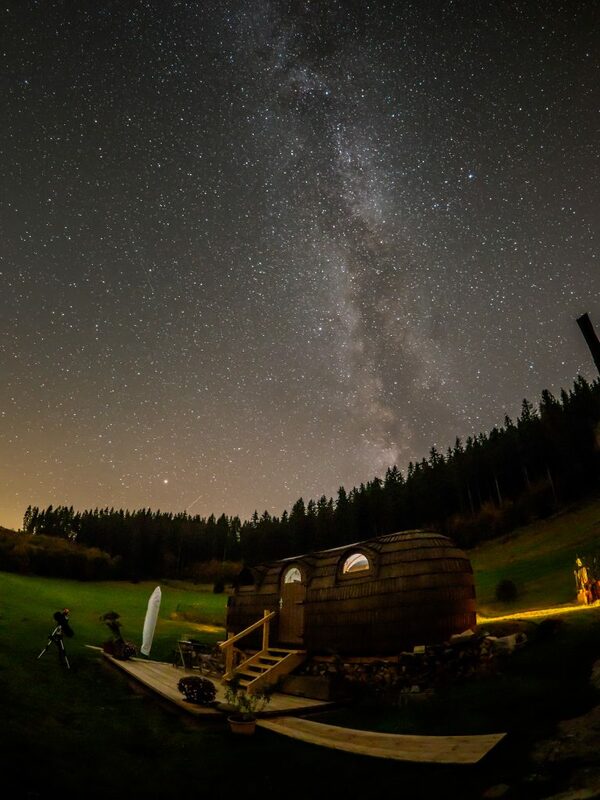 more than 2 hours of exposure time in total. 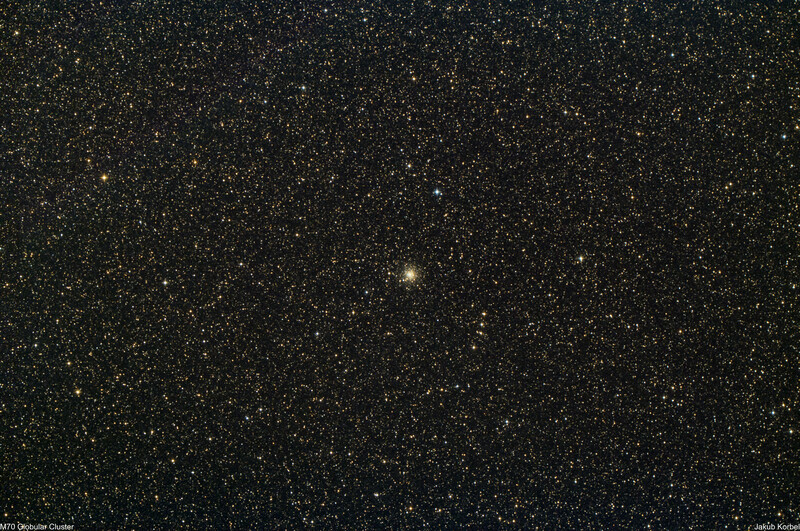 Messier70 is a globular cluster located in constellation Sagittarius. 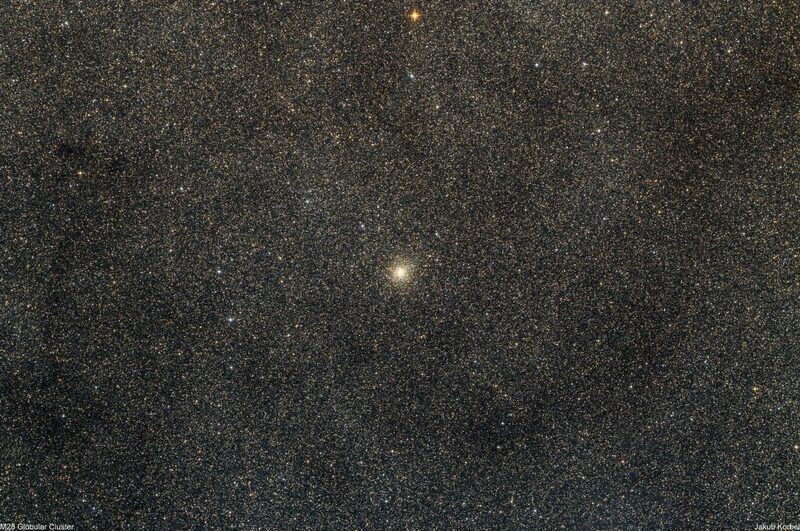 The cluster is at a distance approximately 29’300 light-years from the Solar System. 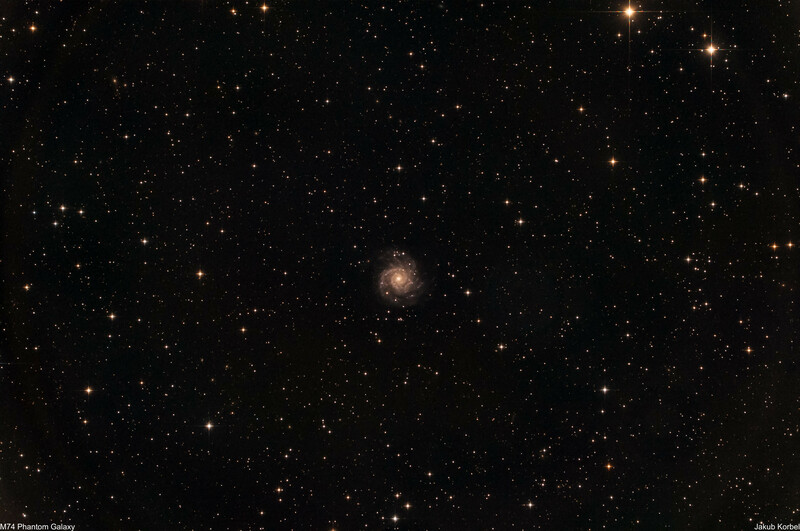 Neighbor cluster M69 was captured during the same night. 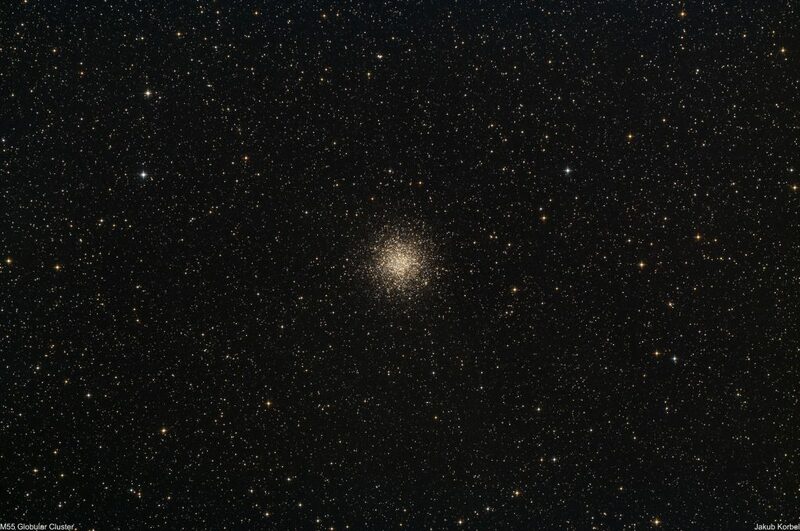 M70 is the 15th globular cluster captured by me on Milos Island – mission accomplished. 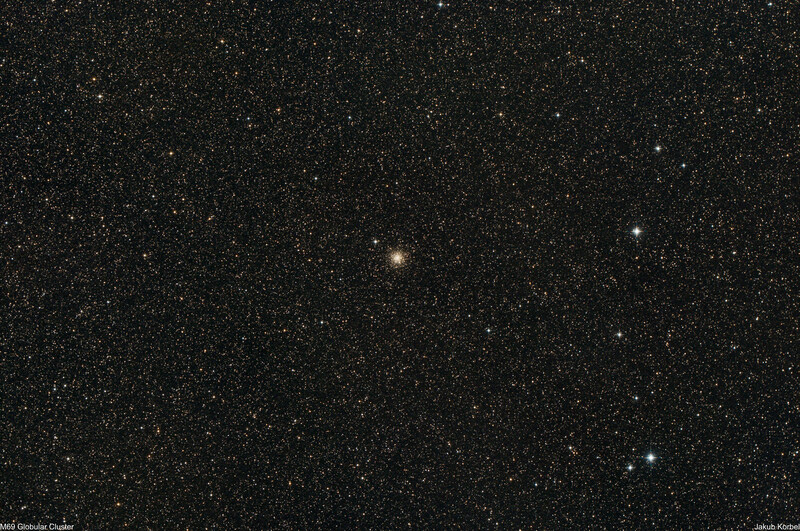 Messier69 is a globular cluster located in constellation Sagittarius. It is approximately 29’700 light-years away from Earth. Together with Messier70 are close to galactic center of Milky Way (distance between them is 1’800 light-years) and there were two last deep space objects captured on Milos Island. These two were the last missing Messier objects, which I wanted to capture and I was very happy that I managed. 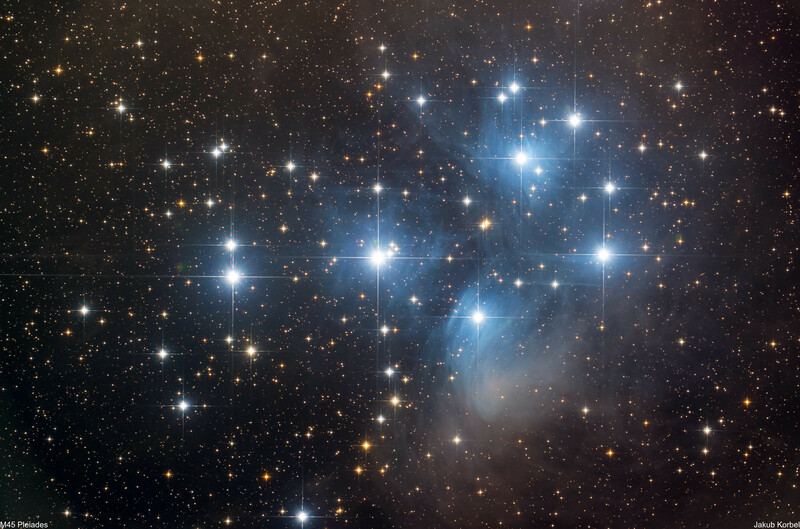 Messier 45, sometimes called Seven Sister, Pleiades or Subaru, is an open cluster located in constellation Taurus. The cluster contains many hot blue stars and it’s characterized by reflection nebulosity. The cluster is easily visible by naked eye and therefore it has been used in mythology of many cultures around the world. The picture was created by stacking of 80 pictures with total integration time 4 hours. In order to capture the nebulosity properly, the light pollution should be minimal, which I manage to experience during our trip to Milos Island. Unfortunately, the mount was not cooperating and in declination axis occurred oscillations due to backlash. Therefore the stars are bit oval. Maybe it’s time to upgrade the mount and pick something backlash free. I would select something portable like Astrotrac 360 or Avalon Instruments M-Zero. Messier 20 (called Trifid Nebula) has been captured by me already on Gavdos. This year I had a telescope with shorter focal length, therefore I managed to capture two objects of Messier’s catalogue on one shot. 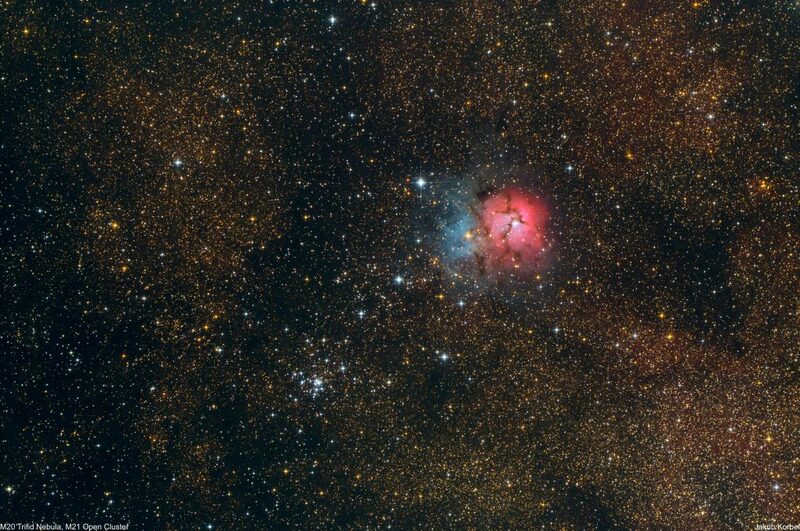 Specifically it’s mentioned Trifid Nebula and M21 Open Cluster (down left from the nebula). 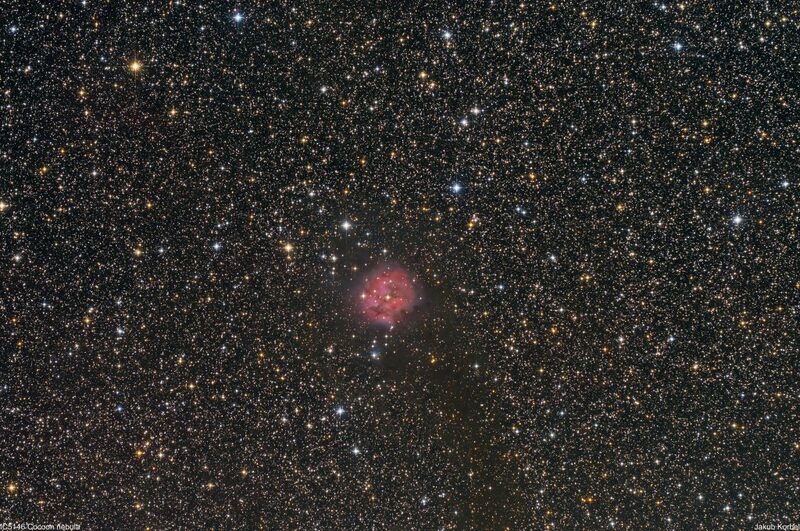 The nebula has been already described in my previous post and it’s located not far from M8 Lagoon nebula. 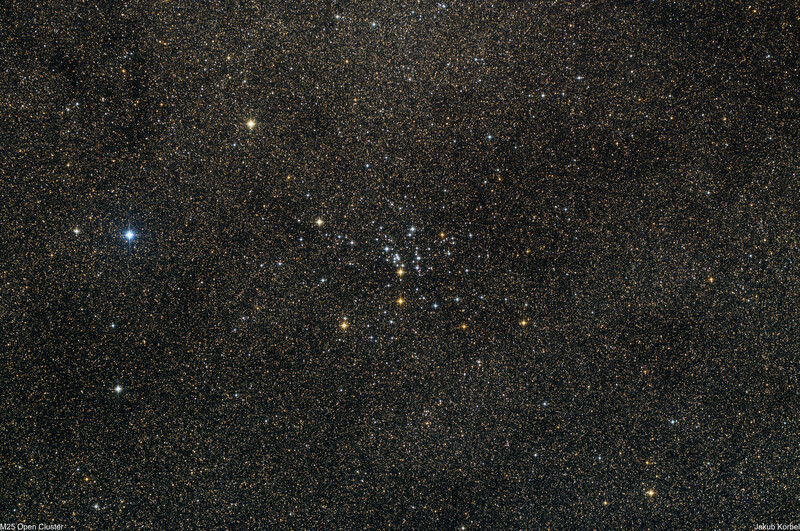 The cluster M21 contains approximately 60 stars and it’s characterized by quite dense core, where the distance between neighboring stars is only one light-year. The picture was taken under dark skies of Milos Island and it’s an integration of only 54 minutes of exposure time. Messier 28 is a globular cluster located in constellation Sagittarius. Center of Milky Way takes care about the background, which is filled by many stars. The cluster is 17900 light-year away from the Solar system and it has diameter approximately 60 light-years. 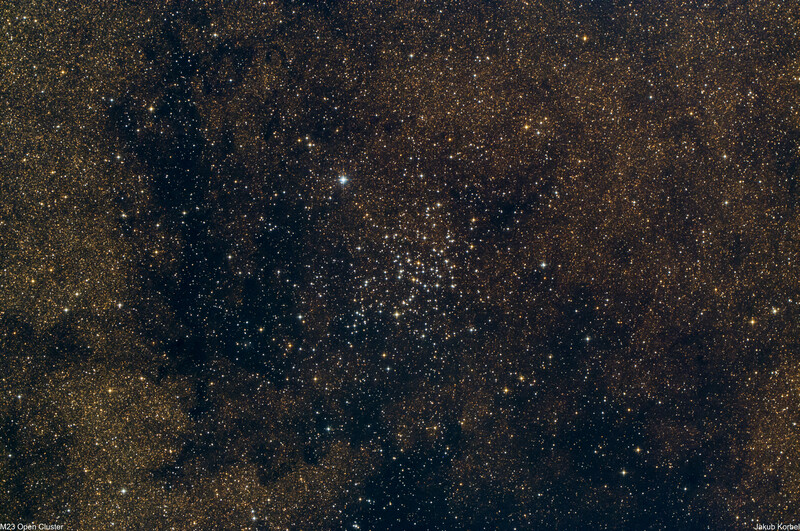 Messier 25 is an open cluster in constellation Sagittarius. 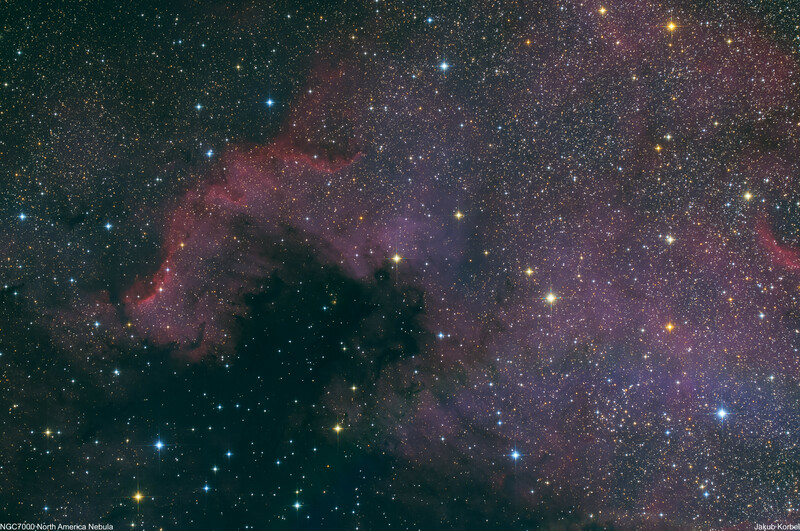 It’s approximately 2000 light-years from Earth and it contains 50 brighter star and probably few tens of dimmer stars. 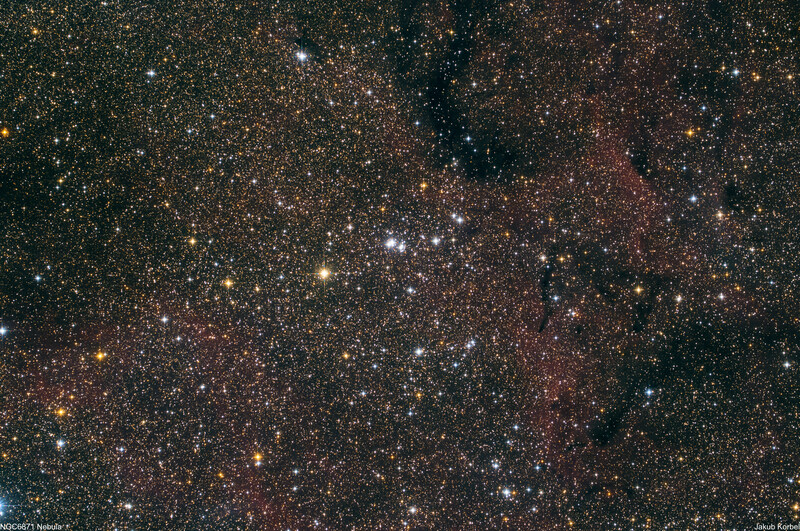 The background in illuminated by many stars, because this cluster is located in direction of the galactic center of the Milky Way. 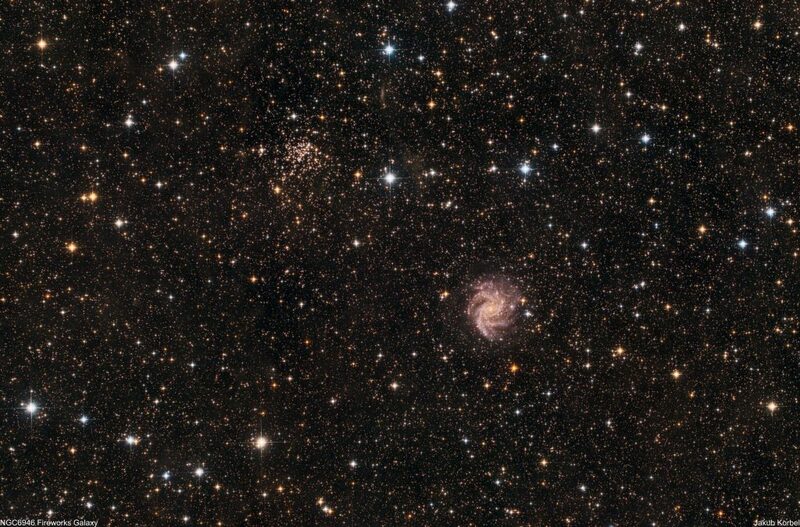 This is third galaxy captured on Milos. First I was not able to resist and captured Andromeda, second one was Barnard’s galaxy and third one is this one M33 galaxy in constellation Triangulum or simply Triangulum galaxy. Andromeda galaxy (biggest), Milky Way (second biggest) and Triangulum (third biggest) form local group of galaxies. 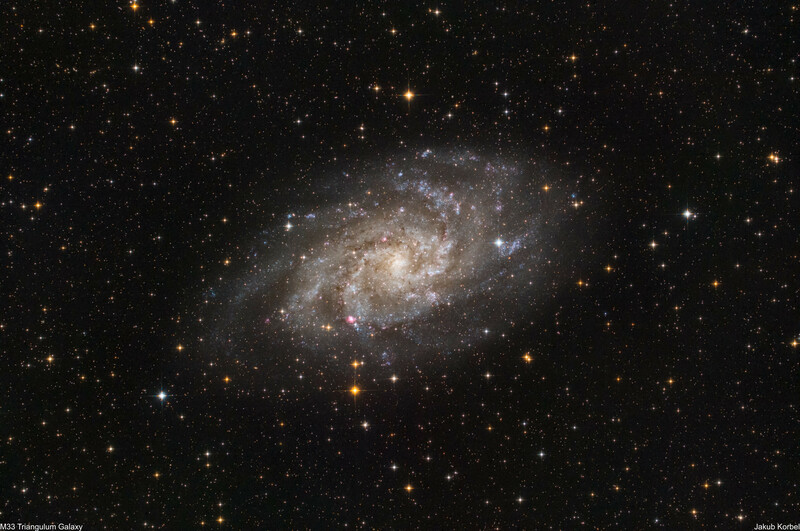 M33 has diameter approximately 60 thousand light-year, which makes it half size of the Milky Way and the light from there has been traveling roughly 3 million years. Messier 62 is a globular cluster located in constellation Ophiuchus and it’s 22’500 light-years from Earth. Globular clusters are the most common deep space objects captured by me on Milos Island. Messier 19 is a globular cluster located in constellation Ophiuchus and it is approximately 29000 light-years far from Earth. This cluster is particularly interesting by its oval shape and most probably it’s the most oval globular cluster in our galaxy. The cluster, just like M9, is quite close to the galactic center. The picture, like many others, was taken on island Milos, under dark Greek skies and it’s an integration of 58 minutes of the exposure. 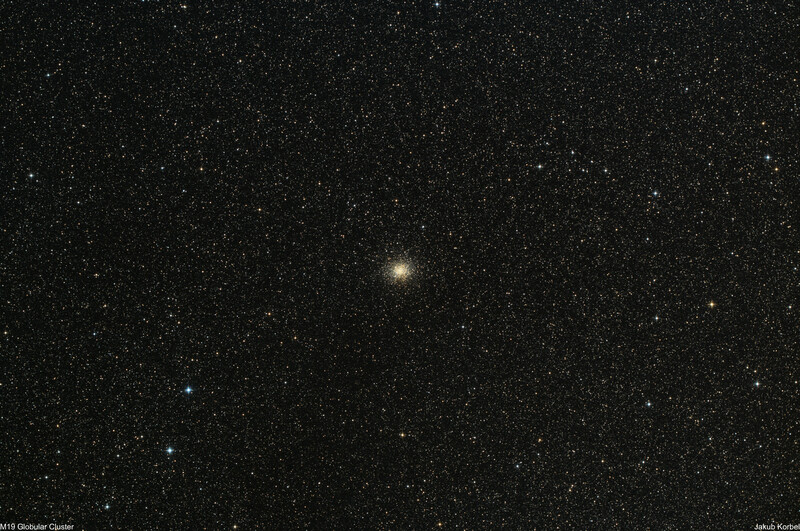 Messier 56 is a globular cluster located in constellation Lyra. M56 is one of less bright globular cluster, because its distance from Earth is 30’700 light-years. 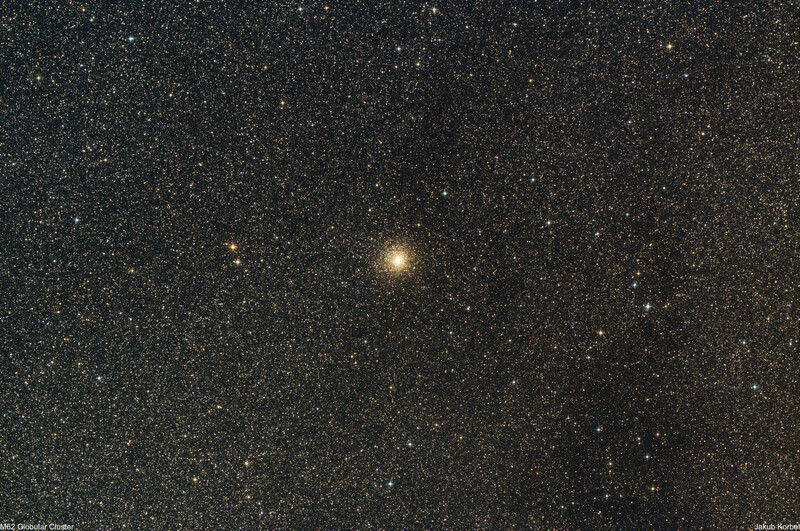 This is the third (M54 and M55) globular cluster captured in single night and the picture is an integration of 63 frames, each 3 minutes long, i.e. 189 minutes total exposure time. Messier 55 is a globular cluster located in constellation Sagittarius. 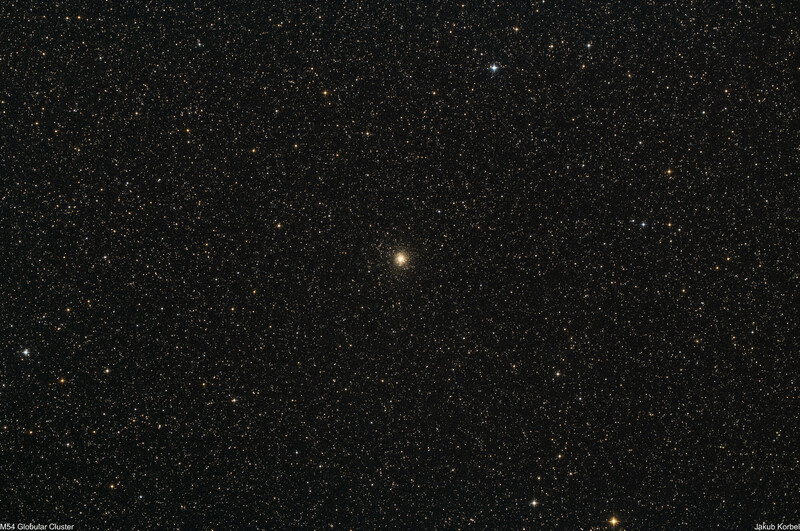 M55 is one of the closest globular cluster, having distance from the Solar System only 17’600 light-years, compared to M54, which is one of the furthest globular clusters (86’400 light-year). I managed to capture these two clusters during single night. 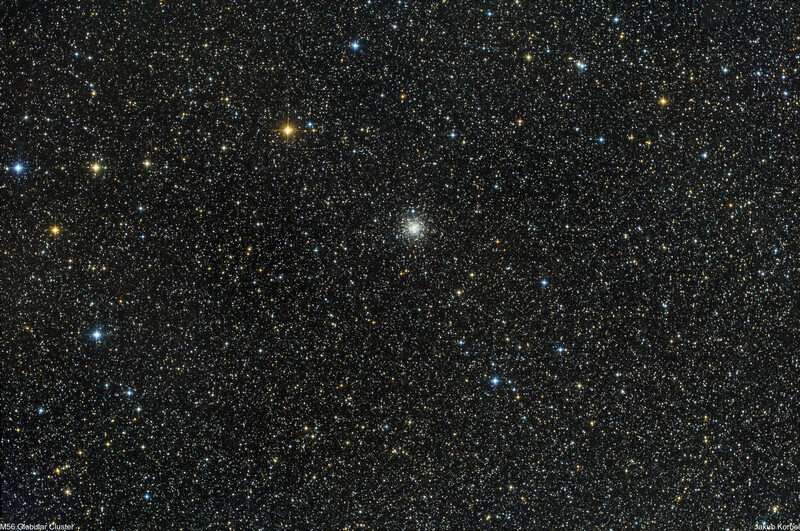 Messier 54 is a globular cluster located in constellation Sagittarius. It has been assumed that the cluster’s distance is 50’000 light-years. Recently (1994) it was discovered that this cluster doesn’t belong to Milky Way galaxy, but it’s a part of Dwarf elliptic galaxy in Sagittarius and it is approximately 86’400 light-year from Earth. This means M54 is first discovered globular cluster outside of our galaxy. 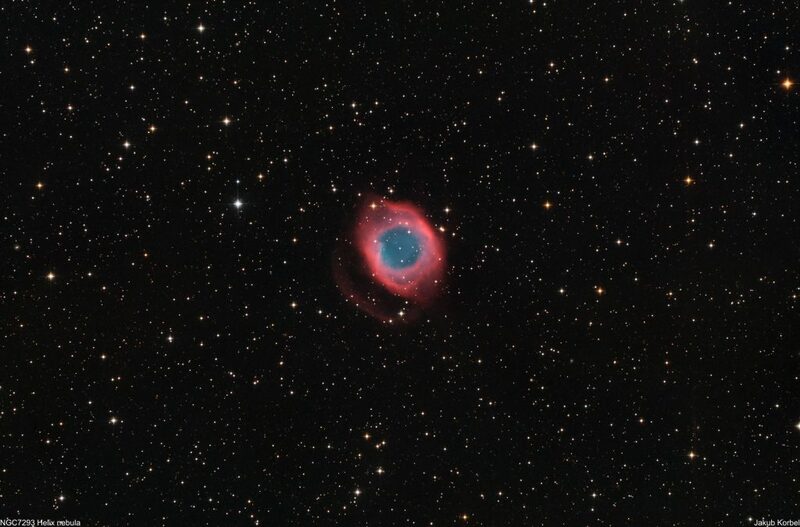 NGC 7293, sometimes called Helix Nebula, is the closest planetary nebula (only 700 light-years away), which can be located in constellation Aquarius. Last year I captured this nebula on Gavdos. This year on Milos I was equipped by different telescope and different camera, so I gave it a try again.